Social cognition is a term that refers to thoughts about social matters. 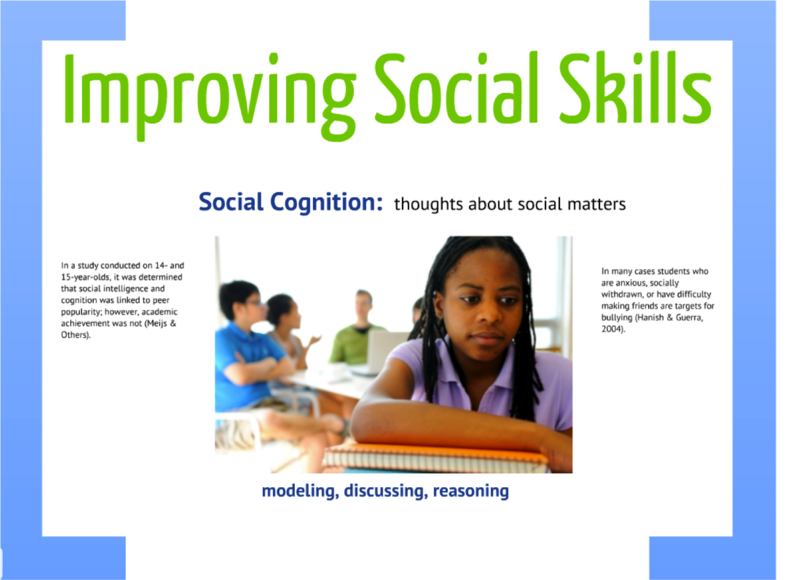 Adolescents in middle school are still learning how to develop proper social skills. In a study conducted on 14- and 15-year-olds, it was determined that social intelligence and cognition was linked to peer popularity; however, academic achievement was not (Meijs & Others). This is especially important because adolescents are still learning how to interact with one another. Middle schools are designed in such a way that students are able to interact with one another on a daily basis. Students who have difficulty interacting with others due to a social or mental issue may not be received well by his or her peers. In many cases students who are anxious, socially withdrawn, or have difficulty making friends are targets for bullying (Hanish & Guerra, 2004). In addition, many students with learning disorders have a difficulty time feeling like they fit in with the rest of the class. In order to help coach adolescents through this time, teachers must help them by modeling, discussing, and reasoning with students about various social issues and topics. It is necessary for teachers to help students understand that even if someone is different, they are still of equal value. No students, especially those struggling with disabilities, should feel excluded from the classroom.